Scientists Hit Antibiotic Pay Dirt Growing Finicky Bacteria In Lab : Shots - Health News A natural compound kills germs that have become resistant to antibiotics, researchers say. If it works in humans, it could help combat diseases like tuberculosis. 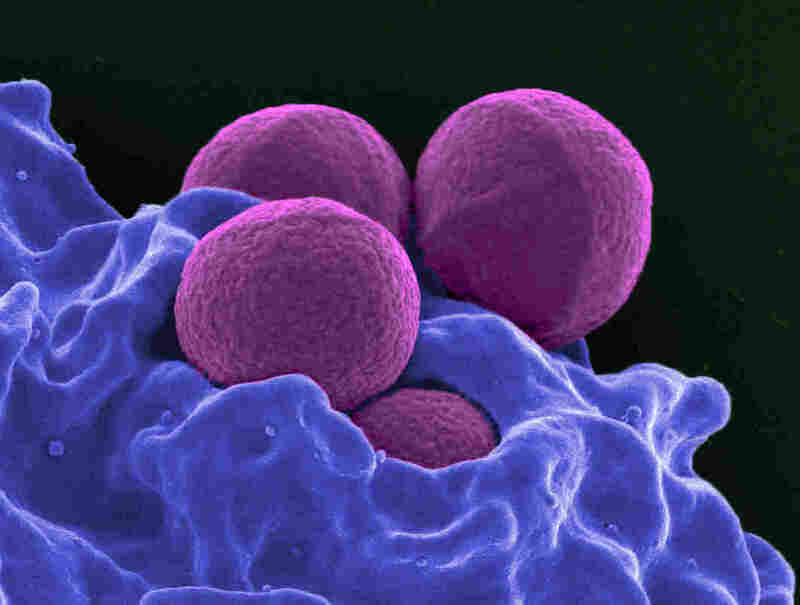 You don't want to run into methicillin-resistantStaphylococcus aureus (MRSA) bacteria. A potential new antibiotic could help fight this bug. Scientists say they have discovered a natural compound from bacteria that may prove to be a potent new antibiotic. This news comes at a time when many current antibiotics are losing their oomph — germs become resistant to them. The new compound is especially intriguing because it appears that it might not lose its germ-killing potential, according to a report published Wednesday in the journal Nature. Curiously, the researchers didn't set out to find new antibiotics. Kim Lewis and his colleagues at Northeastern University in Boston were actually figuring out how to grow bacteria that had never been grown in the lab before. "The majority of bacteria on this planet are 'uncultured,' meaning they don't grow on our petri dishes," Lewis says. "And when I'm talking about 'the majority,' it is 99 percent." So Lewis and his colleagues developed a system that allows them to explore this biologically rich but secretive world. Basically they built a vessel that would hold bacteria-rich soil between two membranes. "Then this contraption, which we call a diffusion chamber, it goes back into the soil from which we took the bacteria," Lewis says. It turns out that once bacteria start growing and building tiny colonies in the contraption, those colonies can be transferred to the lab. At that point they do grow in Petri dishes. Lewis' lab was off to the races. This is much more than just a curiosity. Most antibiotics are derived from natural products secreted by bacteria and fungi that live in the soil, including widely used drugs such as Terramycin, Vancomycin and Streptomycin. So Lewis, collaborating with a company he co-founded called NovoBiotic Pharmaceuticals, started examining the natural compounds secreted by his newly isolated soil bacteria to look for potential new antibiotics. They've already found more than two dozen. And one of them, which they've named teixobactin, looked like a winner: It's deadly to several different kinds of disease-causing bacteria and isn't toxic to mice. "It cured mice of skin and thigh and lung infections," Lewis says. In the lab the compound killed bacteria that cause serious staph infections, strep and tuberculosis. But the best part came when they ran another set of crucial tests. "The most intriguing thing about this compound is the apparent absence of resistance development," Lewis says. It seems that disease-causing bacteria don't become resistant to this antibiotic. And that's because the antibiotic latches on to parts of the bacteria's cell wall that can't mutate. Mutations are how bacteria typically develop defenses against drugs. So Lewis is making a bold claim, tentative as it may be: "This for all practical purposes may be a largely resistance-free compound," he says. "That's pretty exciting news, I think, for the field," says Gerry Wright, director of the Michael G. DeGroote Institute for Infectious Disease Research at McMaster University in Hamilton, Ontario. Antibiotic resistance keeps infectious-disease doctors up at night. For instance, there are some strains of tuberculosis that have developed resistance to all known antibiotics. Still, getting from discovery to drug isn't easy. Wright says there are economic and regulatory challenges in bringing a new antibiotic to market, which governments have been working to solve. "We're moving in the right direction there, and so if we can kick start the science at the same time, we'll have a route toward helping to solve the antibiotics crisis," Wright says. Scientists still need to test teixobactin in people. That's likely to take several years, and there's no guarantee it will work as well in humans as it does in mice. (NovoBiotic Pharmaceuticals of Cambridge, Mass., a company founded by Lewis and Slava Epstein, another Northeastern professor, holds the patent for this potential drug, Lewis says). Even if this particular product doesn't pan out, Lewis and his colleagues at Northeastern now have plenty of other tough-to-grow bacteria that they can study in the hunt for new antibiotics.